Often called the Soul nebula by amateur astronomers, the infant-shaped Sh 2-199 is ionised by stars belonging to the IC 1848 cluster and is also the location of the radio source W5. 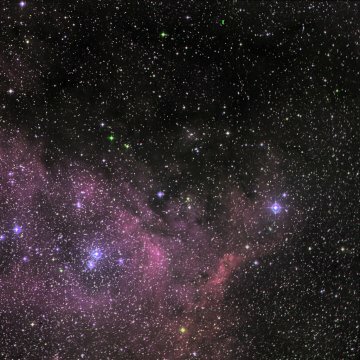 Like the Heart nebula (Sh 2-190) and surrounding smaller nebulae, Sh 2-199 is embedded in the Cas OB6 association. Kharchenko gives a distance of 2002 parsecs and an age of 4.4 million years for IC 1848 and lists 5 ionising stars: HD 17505 (O7, although SIMBAD gives an O6Ve class), HD 17520 (O9V), HD 237019 (O8V), HD 237007 (B0V), and HD 237011 (B2, although SIMBAD gives a slighter hotter B1.5 class). Avedisova places Sh 2-199 and Sh 2-201 in star formation region SFR 137.57+1.08, with 65 components, including 16 infrared sources, 2 masers and 4 young stellar objects. You can view a stunning image of the larger Heart and Soul region here. NASA has released a spectacular infrared image of the W5 region (including most of Sh 2-199) here.